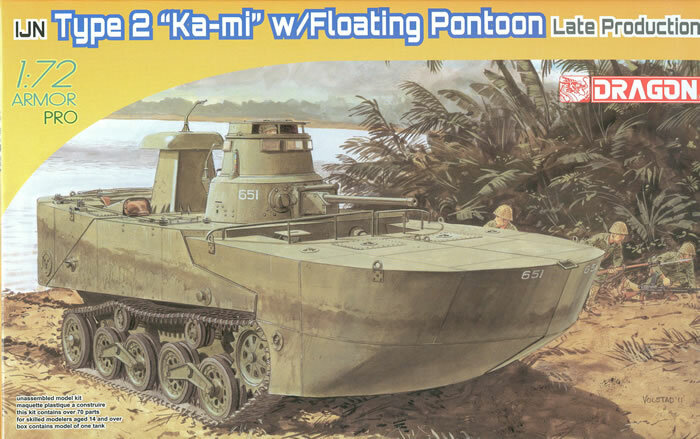 As it did with the cyber-hobby.com spinoff of its 1/35 scale Ka-Mi kit, DML has now produced a late model kit with different parts to provide for the final version with a split front pontoon vice the one-piece pontoon in the earlier kit (No 7485). The kit replicates the previous release (No. 7485) but adds a complete supplemental “A” sprue of 27 parts with the bow and stern pontoon sections, the wading intake and control tower, and all necessary fittings. Note that this kit will build both the early single pontoon and late split pontoon variants. As they have been molded complete, and not simply “stick-on” parts, the modeler may show the model in the process of dropping its pontoons for combat which is a nice option. The split pontoon version comes with the inner sides so it can be shown with the pontoons dropped to either side of the bow. Four (five) marking options are provided, all vehicles in IJN green: Vehicles 651 or 652, Ormoc, Leyte 1944 (white numbers); Vehicle 501, Kurile Islands, 1944 (white numbers); Vehicle 179, Unidentified Unit 1944 (white numbers); Unknown vehicle, Unidentified Unit 1945 (white rectangle on sides of turret). Decals are a tiny targeted set from Cartograph. Overall this matches its cyber-hobby.com “big brother” for quality and should be a popular model to match the previous DML Type 2, Type 95 and Type 97 models in 1/72.